SOLD OUT COMPLETELY! GoodBye, Sweet Clementine:) A Rustic Tree-Free and Recycled Paper Wedding Invitation for a Green Wedding. Tall and textured DIY Eco Invitation. Tree free & post-consumer recycled papers. Bright Orange + brown paper raffia. PAPER FACTS: The wrapper is made from 100% recycled cotton rag, trim gathered from garment production in India. Invitation card and envelope made from 100% post consumer recycled paper, made in the USA or Canada. The wrapper is diecut and scored at our facilities in Pasadena, California. Overall Size: 10 inches tall x 5 inches wide ( a standard stamp size) Finished invitation measures 9-1/2" x 4-3/4"
Colors: Bright orange wrapper maroon paper raffia. Invitation is a complex soft white with yellowish overtones. 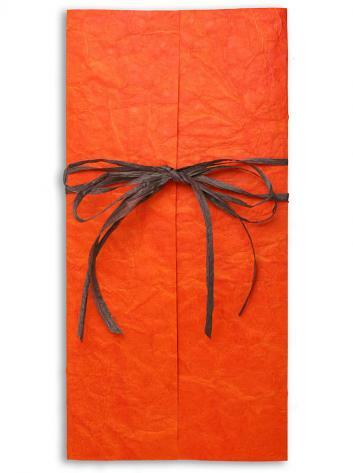 Handmade cotton rag invitation wrapper with a complex crinkled texture. Wrapper is scored and diecut, for easy assembly. Invitation is printed on milkweed recycled cardstock. Closes with a brown raffia tie. Envelope:Matching milkweed 100% post consumer 70 lb. handsome envelope. Custom envelope - with a 4 inch flap at the top. (designed by and manufactured exclusively for Invitesite ). Tie: Two yards of maroon paper raffia.